AuctionInc’s Shipping Rates API offers any website or ecommerce platform the ability to integrate our multi-carrier shipping rates and packaging engine technology. Calls into this xml webservice return highly accurate comparative shipping calculations across multiple carriers based on your business rules and shipping preferences. Many advanced capabilities that simply arent available from other rate sources. We provide developers access to a pre-built software module using a well-defined data structure and subroutine calls. Available in both a "single seller (SS) version and an "integrator" (XS) version for multiple-seller platforms. Our PHP Toolkit greatly simplifies integration. eCommerce platforms looking to incorporate shipping calculations for their vendors. 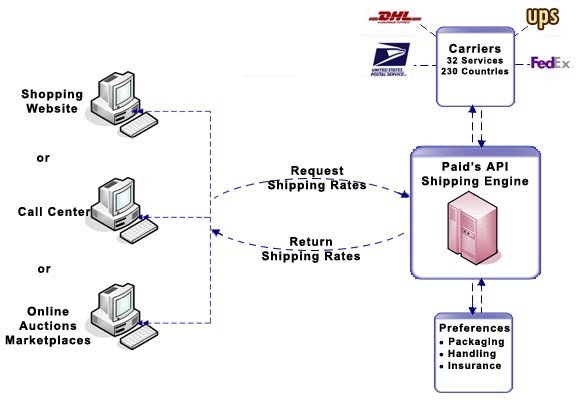 Programmers and developers who need to provide accurate shipping rates for their web store. Mail-order call centers that need to provide quick shipping quotes over the phone. Hosting companies looking to improve /add shipping calculations in to an existing shopping cart. Integrated into the Rainworx and PHP ProBid auction platforms. Integrated into the Level Four Storefront flash cart. Plugin modules available for popular carts including Magento, X-Cart 5, and WooCommerce. Reduce Costs - High costs are involved to internally develop and maintain APIs to multiple carriers. The Shipping API requires only one API for all carriers domestic and internationally which helps to development costs. Rapid Deployment - Our web service uses industry standard XML over HTTP making it simple to integrate your application regardless of software language or hardware platform. Software Development Toolkits available for various languages makes integration a snap. AuctionInc offers plugin extensions for various popular ecommerce platforms, including WooCommerce, Magento, Zen Cart, X-Cart 5, Jigoshop, and others. For a low fixed rate of $25 monthly, you may call into our API up to 10,000 times per month and gain access to our cutting-edge shipping engine technology. This threshold accommodates all but the very largest sellers (overages are charged at one cent per call). These rates assume that you will be using our API on one site and supporting one single seller via our "SS" calls. Our retail accounts prohibit integrating the API into a commercial product or service (with some exceptions for some business models), and prohibit reselling the data from our API. Our "XS" calls, available to integrators only, supports unlimited sellers. (Integrators are intermediaries, such as cart products or auction platforms that are managing multiple sellers.) We offer a variety of flexible pricing plan. Please call us so we may discuss with you what method of integration will meet your needs and what pricing models are appropriate. We offer a development account for you to get you started. Our toll-free phone: 866-323-8833.